This handsome GM’s screen gives the Game Master everything he needs to run an exciting Edge of Midnight game right at his fingertips. Contains six inserts containing pertinent charts and rules, along with gorgeous full-color artwork from the inestimable Nate Barnes. 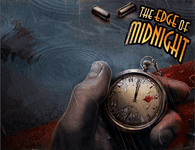 A must for any fan of The Edge of Midnight!